The Brazilian economy is now worth $2.5tn (£1.6tn), according to Finance Minister Guido Mantega. But Mr Mantega was keen to play down the symbolic transition - which comes after China officially overtook Japan as the world's second-biggest economy last year. "It is not important to be the world's sixth-biggest economy, but to be among the most dynamic economies, and with sustainable growth," he said. 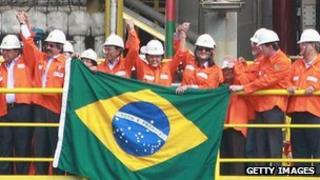 Brazil is enjoying an economic boom because of high food and oil prices, which has led to rapid growth. In 2010, the Brazilian economy was worth $2.09tn, compared with the UK's $2.25tn total output, in current US dollars,according to the International Monetary Fund. However, according to NIESR, using the IMF's figures at current exchange rates, Brazil's economy is now $2.52tn and the UK's is $2.48tn. The larger increase in the nominal size of both economies is explained by domestic inflation. The Centre for Economics and Business Research has also said that Brazil's economy has overtaken the UK's. A UK Treasury spokesman said: "Strong economic growth and large populations in the big emerging economies mean that some will catch up with advanced economies like the UK. This shows why the government is right to place high importance on its economic ties with large emerging economies." In the fourth quarter of last year, Brazil's economy grew by 0.3% from the previous quarter, according to Instituto Brasileiro de Geografia de Estatistica. Both the annual and quarterly figures were less than analysts had predicted. Brazilian President Dilma Rousseff has attributed the slowdown in growth last year mainly to the weak global economic situation and the need to fight rising inflation. Brazil, the largest Latin American economy and one of the so-called Bric nations together with Russia, India and China, has seen its economy soar in recent years, with growth far outpacing the US and western Europe, but sending inflation higher. The currency, the real, fell 11% against the US dollar last year. That is after two years of huge gains - up 5% in 2010 and 34% in 2009. The currency is worth more than double what it was 10 years ago. With substantial oil and gas reserves continuing to be discovered off Brazil's coast in recent years, the country is now the world's ninth largest oil producer, and the government wishes to ultimately enter the top five. Brazil has about 190 million people, in contrast to the UK's 60 million people. And the country has struggled with inequality. The country's Gini coefficient, a measure of income inequality, peaked at 0.61 in 1990 - but 2010's figure was a historic low of 0.53. Absolute and relative poverty have declined in recent years, especially in the past decade, during which the poorest 50% saw their incomes go up by 68%, according to the Getulio Vargas Foundation. The country will host the 2014 World Cup, and Rio de Janeiro will be home to the 2016 summer Olympics. Is Brazil's economic growth enough to draw emigrants home?